The theme for this year’s Rose Festival is “Play Happy”, and you can start doing that by avoiding the stress of parking and ride TriMet to and from the festivities. The fun begins Friday, May 25 when Portland’s annual Rose Festival kicks off with CityFair at 5 p.m. at Tom McCall Waterfront Park. Opening night events include free entertainment courtesy of the RoZone concert series, followed by Opening Night Fireworks. Up to 20 bus lines and all MAX lines serve the Portland City Center, and drop you a short distance from Waterfront Park. Go to trimet.org/planner to easily plan your trip. Hop to it! Use a Hop card purchased at one of hundreds of local retailers, load with value and then tap and go. Learn more at myhopcard.com. For those who don’t ride often, just pay your fare with your phone. If you have a bankcard stored in your mobile wallet (Google Pay, Apple Pay or Samsung Pay), just tap against the green Hop reader, confirm the purchase and go. You can only pay the adult fare and don’t get all the benefits of a Hop card but it’s a convenient way to go. Learn more. Have an Android device? Buy a virtual Hop card at the Google Play store and load it into Google Pay. Tap the phone to a Hop reader and get all the benefits of a plastic Hop card. Learn more. Parades and shovel brigades galore! You’ll want to ride TriMet to and from the parades, the colorful centerpieces of Portland’s Rose Festival that attract hundreds of thousands of revelers to Downtown Portland. Plan ahead and allow extra time while traveling to all parades. 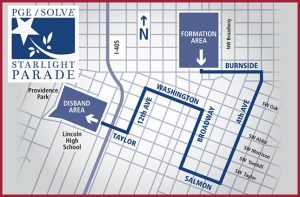 The Starlight Parade starts at 8:30 p.m. Saturday, June 2, and attracts thousands of parade goers who take transit to avoid parking hassles. Be patient and expect some delays at MAX stations in Downtown following the parade as everyone leaves the area at the same time. We will get you on your way. 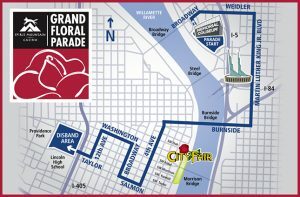 The Grand Floral Parade—happening Saturday, June 9 from 10 a.m. to about 2 p.m.—typically prepares for more than 500,000 spectators each year, so it’s understandably one of TriMet’s busiest days of the year. Plan ahead and go early to that parade as well. We’ll have staff out and about to help you navigate to, through and home from both parades. 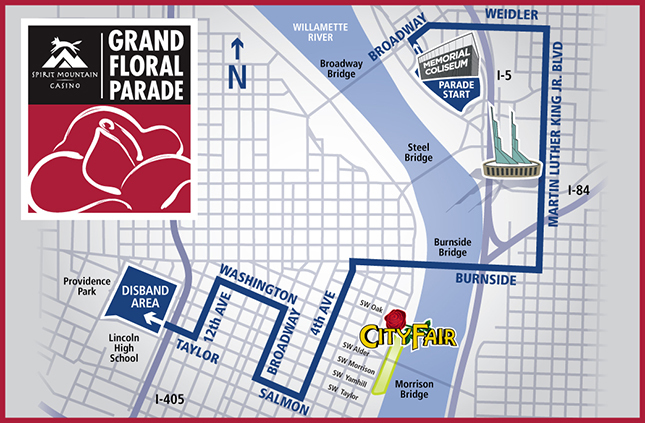 The Rose Festival Junior Parade celebrates the children of Portland on Wednesday, June 7 starting at 1 p.m. in the Hollywood District. Go early. Some bus lines will be detoured and buses and trains will experience delays at time during the parades. Depending where you live, consider using TriMet Park & Rides that are a little further away from Downtown Portland. Those closer usually fill up first. MAX will have special service for the Starlight Parade, and regular Saturday service for the Grand Floral Parade. All buses will run Saturday service schedules on Starlight and Grand Floral parade days. Special express buses will run between the Lloyd Center/NE 11th Ave MAX Station and downtown before and after the Starlight Parade. Get details at trimet.org/rosefest. Expect long waits and avoid bringing big strollers on MAX following parades, especially the Starlight Parade. As folks leave at the same time, finding space on the trains will take patience. Take transit to check out the big ships docked along Waterfront Park for Fleet Week. But plan ahead for delays when the ships come in and leave. This year, ships begin arriving Wednesday June 6 and are scheduled to depart Sunday June 10 and Monday June 11. This will cause delays for all MAX lines as well as for buses that use the Broadway, Burnside and Steel bridges. Few Rose Festival events are more steeped in tradition than Fleet Week. It has been a part of the Rose Festival since it began in 1907. One of the purposes of Fleet Week is to celebrate and thank the active and reserve military personnel and all veterans. We’re just getting started! There’s more Rose Festival fun for you and the family. Go to rosefestival.org to learn about all the different events. Then, head to TriMet’s online trip planner to easily plan your trip with information on travel and walk times, transfers and cost. Visit trimet.org.